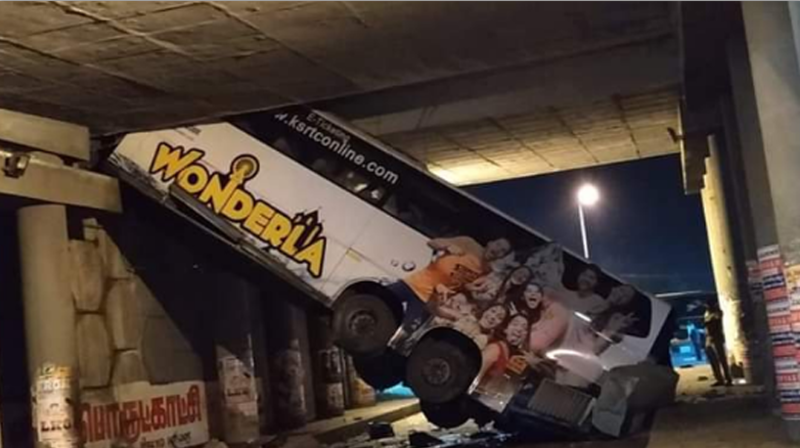 Coimbatore : It was miraculous escape for 26 passengers of a Kerala State government bus, which nosedived from a bridge, after breaking the parapet wall, leading to injury to 14 passengers near Avanashi in Tirupur district in the wee hours of Sunday. The bus was proceeding to Bengaluru from Pathanamthitta in Kerala when the driver, reportedly under influence of liquor, lost control of the vehicle, which was moving in high speed and hit the parapet of a fly over and nosedived around 2.30 am police said. In the jerk, 14 passengers, including two children and six women, sustained injuries and after first aid in Avinashi Government Hospital, brought admitted to government hospital here, they said. Police and personnel from Fire and Rescue department managed to pull out all the passengers and it took nearly one hour to take the driver out, as the front portion of the bus, rammed onto the road.